Investigate rumors of discourse at Alcaire Castle. Dame Dabienne has expressed concerns about events unfolding at Alcaire Castle. She asked me to go there and see if I can help. After you have exonerated Dame Dabienne in the quest False Accusations, talk to her again to find that she is concerned about the situation in Alcaire Castle. 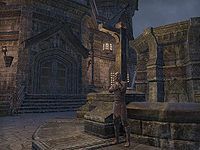 Rumors have been circulating about spies, plots, and even an army of Redguards marching on the castle despite the Daggerfall Covenant. She wants you to investigate and find Messenger Cordier — the same guy you rescued from the slavers in the last quest — as he should be announcing your arrival to the Duke. Head up north, passing through the Daedra-infested lands around Nurin Farm. There are several quest givers along the way. You'll find Cordier in front of Alcaire Keep, by the fountain. He will immediately remember his mission... having forgotten altogether to tell the Duke you were coming. There's nothing for it, he says, and he'll hand you 42 gold. This page was last modified on 6 December 2017, at 22:45.